CARE Grows as global collaboration and partnerships raise awareness and strengthens the future for our Community. CARE Grows with every medical and therapeutic advancement that leads to improved care. CARE Grows as donor commitment broadens to support new educational and research opportunities. Join the CDG Global Alliance – a private Facebook group for parents, patients and immediate caregivers of individuals who have a confirmed diagnosis of CDG. Like and Follow the CDG CARE Facebook Page – a public Page open to all families and community supporters to help keep current with the latest news, research and opportunities within the CDG Community. This year's Campaign will run February 28th through May 16th. If you are organizing or running in a 5K run/walk, asking families to donate to your favorite cause for your birthday, or doing a tribute in honor of a loved one... we have got you covered! Crowdrise is an easy use charity platform. Just visit our Donations Page, create your Fundraiser or Event, and join our efforts to raise CDG Awareness in your Community and Nationwide! 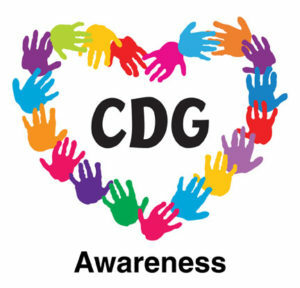 We are again offering CDG Awareness Day wristbands and magnets while supplies last! These items are perfect to give to friends, share with schools, distribute amongst your community and show your support for CDG Awareness Day! SAVE THE DATE... July 26-28, 2019 for the upcoming 4th World Conference on CDG to be held in Lisbon, Portugal! For a copy of the Program Agenda, Registration and Volunteer opportunities, please CLICK HERE!